In which nobody wears the pants in the X-Plain family; Havok is a remarkably okay boss; Polaris may want to find a new doctor; Quicksilver has no time for your nonsense; we are very conditionally okay with resurrections; and if you spoil Season 5 of Steven Universe for Miles, we will never ever ever forgive you. While not a hero, Dracula is from Romania. And Greece is sometimes counted as part of the Balkans, so there’s Hercules too. To make Miles happy, may I suggest that the possibility that Phantazia gets her legs back when she’s knocked out or loses concentration, and her floating intangible-ish form is her powered up form? Taylor’s powers seem at least vaguely reminiscent of Larry Bodine’s, so clearly “light sculpting” is NOT a power to have if you wish to lead a happy life in the MU. Oh man. The two most important fictional points of identification in my life intersecting in this episode is pretty much everything. Between growing up reading X-Men and having that be a major point of representation, and the show about a queer femme kid and the women he aspires to be (that my deadname is Steven makes each episode the best kind of therapy)… Yeah, I feel every bit of this so hard. And re: Lars – Yes. Absolutely. 100%, the best pairing ever. How much effort would have to go into stopping Logan from sidekick-adopting Connie Maheswaran? I also could see Connie helping out New Mutants-era Doug and teaching him how to be good at combat despite not having combat-based powers. They’d totally bond over the need to feel helpful and also their experiences with fusion. Yay! Thanks for answering this! And making it so darn delightful! I now would also love to see Miles cosplay as flashback Greg at some point…. After asking this question, I realized that – no matter what else – there’s probably some weird side adventure going on with Doop and Onion. Being an evil mutant ironically is still being an evil mutant. Witches on the Disvworld get advanced warning about exactly when they will die, which as the author notes, explains a LOT about witches. Some get more warning than others, some may get only a day, but it’s enough to put their affairs in order. Steven with Warlock — because of the Centipeetle episode where Steven played the Doug Ramsey role opposite a non-English-speaking alien? “Prodigal” is a very odd name for that chap to have chosen. “The prodigal son” is the one who left home to live a hedonistic, selfish, life of excess, only to go flat broke and have to return home to seek forgiveness, and the chap here seems to be the exact opposite of that. Or was he just trying to show the “Brotherhood of Evil Mutants” that he could use sarcastic naming conventions too. Oh, and I loved the Ren and Stimpy t-shirt gag (though I never warmed to the cartoon). It makes me think of a bit of business in the Legion of Superheroes when Triad (aka Triplicate Girl, who has the awe-inspiring power to turn from one ordinary teenager into THREE ordinary teenagers) splits whilst wearing a red white and blue swimsuit and each of the three ends up in a different colour, with the style suiting their differening personalities. The Extrovert third gets a red bikini, the Introvert third gets a demure one-piece white number and the remaining Balanced third is left with a fairly ordinary blue swimsuit. I love sci-fi costume weirdness like that. It might be an American thing, but a lot of people misuse Prodigal to mean “person who has been away for a while and now is coming home.” They ignore that prodigal means wasteful and instead merely take the homecoming part of the story. This is one of those times when I think everyone else must understand a rule of cool that I don’t, but when has that stopped me? The M’Kraan Crystal is a very large, very powerful pink crystal. 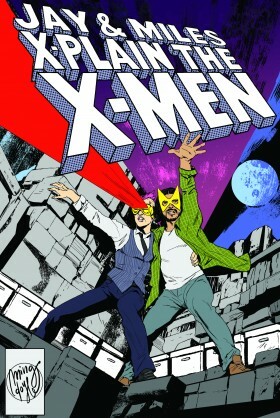 That crossover has been inside the X-Men all along. Secret Wars II wins out over the X-Cutioner’s Song because Secret Wars II gave us Boom Boom, while the X-Cutioner’s Song brought the Legacy Virus.